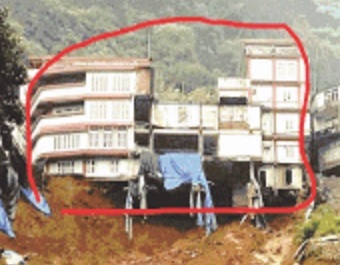 The Mizoram government has ordered late B Sairengpui’s relatives to immediately demolish her building which is located at Hunthar veng locality of Aizawl as the building is on the verge of collapse due to landslide. 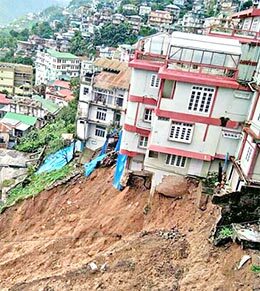 The order was issued by Aizawl district Deputy Commissioner Dr A Muthamma on Monday as there is every possibility of the building causing collateral damage to nearby residents. The building belonging to renowned government official, B Sairengpui, sister-in-law of State Chief Minister Lal Thanhawla is one of the several houses in the area affected by subsidence of land for quite some time. Last year, the local administration had dismantled six other vulnerable buildings in the region. The government also ordered to demolish B Sairengpui’s building last year, bur the order was not executed. The land subsidence at Hunther area has worsened due to incessant rainfall that lashed the State last week. Huge portion of the soil on which the building stood has slid, leaving a large hole under the building. Dr A Muthamma, who is also the chairman of District Disaster Management Authority along with other officials visited the area on Saturday and inspected the building. The National Highway that connects Aizawl and the State’s only airport Lengpui Airport and western parts of Mizoram runs through the sinking zone, which means this road is likely to be blocked if the building collapses. There are also chances that if the building collapses, a huge portion of the road, which is part of the National Highway, that runs on the upper side of the building will go with it, and also put several other houses nearby in danger. Meanwhile, the flood situation in low-lying areas of Mizoram has improved as there was no rainfall for the last four days.